New Toy for Phoebe and Master! I am researching cat food at the moment. Ever since Benji fell sick last week and started throwing up for no apparent reason, I've been considering switching his food to something gentler on his stomach. We're currently feeding our cats Royal Canin, which is as good as it gets but it still doesn't hurt to find out more about other types of healthy and nutritious holistic cat food available in the market. I found a very useful website for both cat and dog lovers alike, so if you fall in the mentioned category, feel free to visit. Besides holistic cat food, Healthy Pet Food also offers holistic dog food. What's good about holistic cat food is that it does not contain Steroids, Hormones, By-Products, Artificial Colourings, Corn, Wheat, or Soy. Most importantly, NO Chemical Preservatives are used. Instead, it is infused with powerful Antioxidants like Pomegranate Extract and pure digestible Protein sources that delivers fresh human-quality ingredients to your pets to ensure a long and healthy life. You can actually make your purchase online and there's also the promising additional prospect to run your very own home based pet food opportunity. More information can be found at Healthy Pet Food. As a cat owner, I find this extremely interesting so other pet owners, do take note! And speaking of my babies, of course I did not forget them while I was happily shopping in Tokyo! I got my cats an adorable, fluffy friend - the laughing cat. Basically the cat works on batteries and will laugh hysterically when it detects any movement nearby. The TMX Cookie Monster is for yours truly LOL! I have to replace the batteries first prior to having it fully functional so maybe I'll take a video of me playing with my new toy later. Meanwhile, enjoy this picture of Phoebe meeting her new friends. The other two were too afraid to venture close! =-O =-O Phoebe @ WOAFS! And how come u too not sleeping? Thank you Ane, meow! I just washed her tee, must make her wear it soon lol! strength or energy, he never seems to ran out of energy! Lucas tore off the leg? =-O =-O =-O hahahah so cute! Actually, I slept at 9 pm Marzie, then woke up at 12:30.. :-D hehe Yay! yeah i went out clubbing Ane! so tired lah my legs Mariuca! coz dancing+high heels.. hahahahhaha! I know Marzie! I need more energy to keep up with him! put it back on cause I can't sew.. LOL :-D I can cross stitch but not sew..
Yay! 3 chops is an improvement! :) ususally 0 so happy with my 3 chops here! hope can chop here some more! June is almost over! Elmo is superb cause he’s red! friend is right! Keeping up with a toddler is all the exercise we moms need! alone cause he might hurt himself! Haha! I will try to sew it back on! Mon! See Phoebe in red here! Meow! hehe yeah Marzie, and he's cute! :) I think Lucas likes him cause he's red..
Chakai is a girl, usually not so active as boys. When my friend visited me with her baby, she could not sit still at all, followed her baby everywhere the whole time he he! Boys are so much harder to care for Marzie!! I got one PB from RM that’s all ladies. This one is from Link Worth, have u guys joined? I can imagine Ane, boys are so active! He he u dropping ec today Mon? I am dropping for MPG now..
u finished dropping for MD edi? ohhh must have PR eh? Go Liverpool go! Go Phoebe go! Hugsy Pheebs!! u mean have to put the links at the sidebar? I just finished woafs Mon, now hafta drop 200 for MD and I’m done! Mariuca, u open i few blogs at one time then u drop or how? I open 30 -40 blogs at one time, then drop…. You? what abt the one below yr post? is it LW oso? The one below my post???? Link Within? I use Firefox, u using firefox too right Mon? So cute la asking me to teach u he he!!!! yeah i oso using firefox...hehe! But u said link within won work for TUO right, when ud id ur makeover last time? I mean u have to open one by one. If u use the ec toolbar, then can open all at once… but I don use the ec toolbar. u mean u also open one by one and drop? now i lagi confused hahhahhahhahha! Ok, I think it shld be okay now Mon, u try la later, add Link within to TUO! :) Cool right the widget? yeah, nice la the widget! Yeah finished edi he he! Finally free from ec lol! 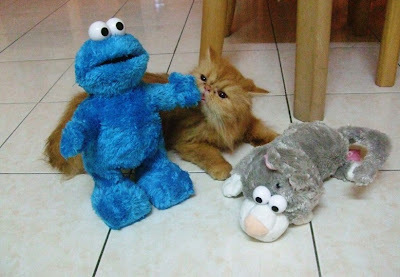 Bestnye ada cookie monster hehehe.. Why is Phoebe trying to eat the cookie monster? He's not a cookie, he's a cookie monster. Right, Cookie Mon? hahhahaha.. so cute.. laughing cat!! i can just imagine the kids running around after hearing that..lol! GP!! you dah ada ask2link ad lah!! congrats dearie! You're not on linkworth yet Ane?? OMG .. come come email me dearie! Hope your Benji will recover soon. I send her lots of healing! He is actually a very sweet and playful little cat besides Phoebe. the laughing cats are too cute for words. i bet Phoebe is delighted to meet her new friends. Good morning Marzie and happy Monday! Thanks Tekkaus, Benji is much better today, meow! so cute playing! it's a good idea changing their foods, I hope benji is better now. How's Chubbs and Benji and Phoebe today dearie? Can't wait for the video GP! Me too.. pampered to the max! LOL @ LJ oso not offended by Tekkaus’ comment ha ha! We love meows and we love pampering them yay! Benji is better now Ayie, meow! LOL! Mmg best to pamper our kids LJ, good practice for when we actually do have human kids he he heheheh! Hahaha.. nape you lock the kiddies up GP?? Of coz have to lock them up once in a while LJ, dust bunny mah! Mengamuk of coz but what to do, lepas tu I upah them with wet food so they love Master again lol! Hehehe. wet food always does the trick! Yeah! They all love wet food LJ, esp Benji makan cepat2 tamak LOL! Waaaaaaatch me remove the stupid widget dearie ha ha! 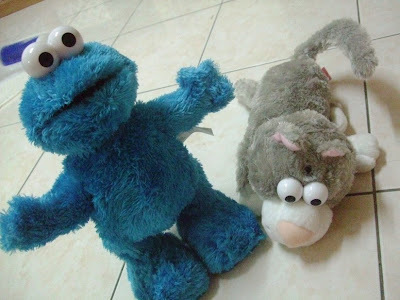 Hahhahahahhahahahaha Cookie Mon is da best so far la Bem, cutenye! Hahahahhah tu la, mmg cute LJ and a little scary la kalau u listen to it mlm2! LOL!